This time last year we made a list of SEO trends for 2015, mentioning Google’s HTTPS Everywhereinitiative as one of the ideas that were to become more important for webmasters in the following years. First announced back in August 2014 at Google’s I/O Conference, this initiative was designed to stimulate a wider adoption of HTTPS and highlight the significance of website security. Though perhaps not the most actionable advice to give to a startup owner worried about the costs of shifting to HTTPS, Mueller’s answer implies the value of taking this step. Namely, security is becoming a growing concern and everyone – from end users to website owners – needs to work on this in order to create a safer web. After all, compensating on security may turn out to be costlier than getting a SSL certificate if a major data breach occurs. Therefore, SSL represents a long-term data protection strategy and as such should be a focus for webmasters in the following years. SSL stands for Secure Socket Layer, a standard encryption technology used to transfer data from a user’s browser to the web server. Websites use SSL encryption to prevent hackers to intercept and misuse the data users leave on a website (via checkout pages, as well as registration or contact forms). SSL largely functions using public and private encryption keys, out of which the former is used to scramble the information, while the latter decrypts it so that it could be read by someone monitoring the transmission. On a website, the secure transfer via a standard SSL certificate is marked with https:// in front of the website URL in the address bar, as opposed to http:// that represents a standard protocol on websites that do not use SSL. When a person visits a https:// page, therefore, his or her communications, data and transactions are safe from potential information skimming or sniffing. Quite logically, this is particularly important for company and ecommerce websites that collect personal information, where the use of SSL certificates is a matter of corporate credibility. 1. Use SSL certificates issued by trusted Certificate Authorities in order to protect visitors from potential man-in-the middle attacks. The certificate authorities are associated with legal regulations and aim to verify the website as a trusted resource. 2. Decide on which type of certificate you need: single, multi-domain or wildcard certificate. 4. Use protocol relative URLs to minimize the possibilities of serving 404 pages when a user lands on a URL loaded from a development environment. These are just some of the key steps in the whole process of shifting to HTTPS and simply getting a certificate is not enough to actually provide secure communications. Namely, after choosing the right SSL provider and obtaining the certificate, there is a set of steps that need to be taken on a website in order to ensure Google will index it properly. If you need help with setting up your SSL certificate, contact us. 1. Redirect your server to point to https instead of http. 3. Set SSL for your CDN. 4. Consider setting Google’s SPDY networking protocol to make your site faster. Of course, this may not immediately result in significant traffic boost, but will definitely bring various benefits long term. More importantly, the shift to HTTPS is not relevant for SEO only. As online security becomes a more and more important issue for the online users worldwide, companies need to ensure they’re doing everything they can to ensure maximum security for their users. Additionally, as pretty much all know, SSL certificates can be pricey. 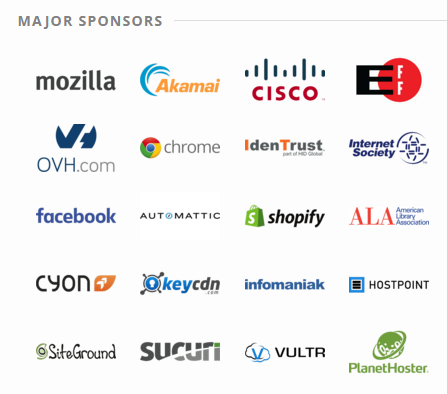 Because and due to the fact that web deserves free and uncompromissed security Let’s Encrypt (joint initiative of plenty of big names in web industry) started operating about month ago in public open beta of their service. Let’s Encrypt offers clients (there are packages for couple of most popular operating systems) along with some 3rd party clients available on GitHub which are able to automatically generate and renew certificate at designated time saving you both money and time. Be cool, let your sys admin know and help supporting the open web along with sparing some cash! Win-win! While the wider use of HTTPS can have some evident benefits for the future of the web, many website owners see the “imposed” transition as an unnecessary burden and extra costs. It is true that a large number of websites do not have checkout pages or any other data collection forms, so they may not really need to spend extra to secure web server communications. For them, getting a SSL certificate is an additional cost and potentially a technical hurdle. From this perspective, it is clear that not all the websites need SSL at this moment. However, this is a general direction in which the SEO world moves and is certainly an important thing to consider. This is illustrated in the case of The Washington Post, which took months to redirect all their pages to the encrypted versions. In a story of the magazine’s ten month long transition to https, Will Van Vazer pointed out to all the challenges of the process, emphasizing the fact it was worthy after all. Although evidently a technical thing, setting up a SSL on a website does not necessarily have to be that complex or expensive. CloudFlare, for example, has been giving free certificates to their consumers since late 2014 with an aim of encouraging a wider adoption of the company’s Universal SSL. Therefore, for all the website owners who think that the transition to HTTPS makes sense for their business can find an easy and affordable ways to do it. In addition to the SEO value, however, there are different other reasons why SSL should be implemented. After all, getting a certificate for SEO reasons only is not what Google actually tried to encourage. The importance of security the website has to do with providing excellent user experience and this should be a primary motivation for webmasters to implement it. The importance of using SSL seems to have been making headlines only after Google decided to treat it as a ranking signal. Nevertheless, its role in improving a business’s reputation has been vital even before it has become one of the search ranking factors. Namely, this form of a security practice may paint a better picture of a company or website, which helps in maintaining stable reputation online. When it comes to actual user perceptions of secure protocols, different reports show that internet users generally pay insufficient attention to online security despite the fact they express concerns about this issue. When it comes to SSL, however, it could be assumed that an average user is unfamiliar with the technical jargon related to it as pointed out in a related study by researchers from Carleton University in Canada and National Research Council in Canada. The study showed that people make little difference in terms of decision making between website that use SSL and those that don’t. According to them, this is especially important for the browser Chrome, where little space is available for showing security cues. On the other hand, when a proper trust badge is placed anywhere on a website, users feel more secure using their personal information on it. Some websites decide to place this badge in the footer section and especially on product pages, where users are required to leave their data and make a transaction (on ecommerce websites). Therefore, despite the fact the average internet users make little difference between http:// and https:// protocols, companies should consider using the latter to prevent data loss and gain users’ trust. With people gradually becoming aware of online data security and privacy issues, business websites need to raise the standards in this respect. Coupled with better search rankings, SSL implementation obviously offers multiple benefits and should be seen as a strategic activity for all modern companies. With billions of commercial websites now serving the global market and collecting users’ personal data in one form or another, employing sufficient security practices is essential for a successful digital strategiy. One of the most important web security measures, SSL has been long established as an industry standard in the US and other countries, now gaining more attention as one of Google’s search ranking factors. For the SEO world, this means that more webmasters will need to consider improving their website security practices and thus directly improve users’ experience. Have you moved to https yet? As a webmaster, what do you see as the major challenge in this process?